I went for a solo hiking trip to the Garhwal Himalayas during end-Apr/early-May. 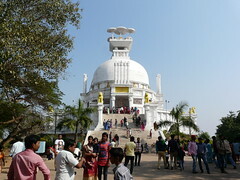 The plan was to visit two temples that are middling pilgrimage destinations. I say middling because Garhwal has some of the most visited pilgrimage sites in India, and my two destinations were not among those! I went right at the start of the pilgrimage season, when the snows have melted and the cold weather retreated from the 3000-4000m (10,000-13,000ft) high elevations that these sites are located at. However, the ideal season for hiking in this part of the Himalayas is Oct/Nov, and as I learnt this is with good reason. Since this was the first time I was hiking on my own, I decided to do a really short first hike (just 3.5km from the trail-head) to the Tungnath temple, and if that was successful I’d try the longer (about 20km) hike to Madhmaheshwar temple. I had it at the back of my mind that I might hire a guide locally, at least for the longer trek, if I didn’t feel comfortable doing the trek on my own. As it happened, I had barely reached Ukhimath, the town near both trail-heads, that a guide came up to me at an eatery and offered to come along for both hikes! At the end, I’m glad I hired him, because I don’t know if I’d have had the guts to start walking on a trail all alone without knowing what to expect at every turn! The biggest problem with hiking during this season (the beginning of summer), and especially this particular season, was the smoke due to forest fires. Some people contended that these were uncontrolled forest fires raging all over Garhwal, others that villagers had set these fires to burn slopes for their livestock to forage on. It was probably a combination of both, but the result was that the whole of the Garhwal region was smoked up to an extent I had never seen before in my life, and neither had many of the people I spoke with on the way. The smoke in the air became apparent as soon as I entered the foothills at Rishikesh, and continued all the way up, everywhere I went! It was quite crazy – one could barely see the next hill clearly. 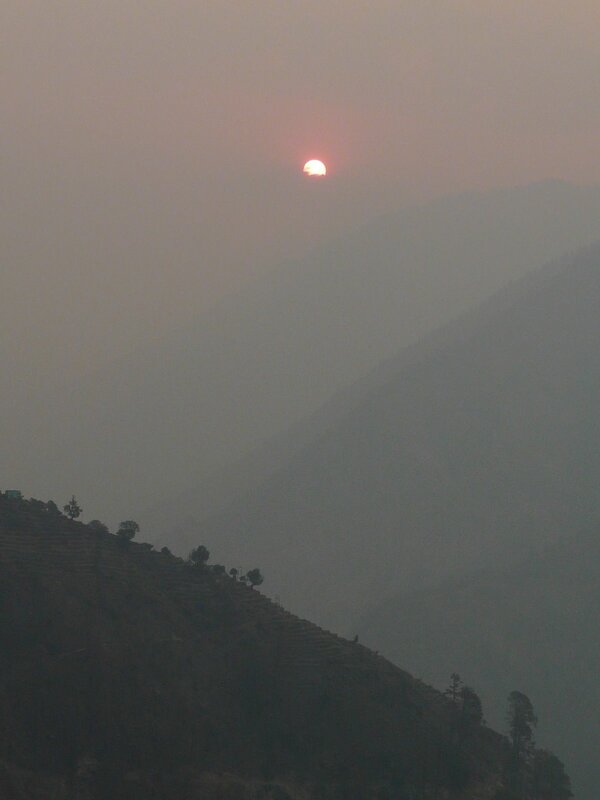 Just to give an idea of how smoky it was, this is a photo of a sunrise at Ransi village. This photo was taken at about 7am, when the sun was already well in the sky, and it should have been nice and early-morning sunny. I’m not kidding when I say that the smoke was the worst I’ve ever seen! Nonetheless, I attempted both hikes. Tungnath was first, pretty easy distance-wise but very steep going. There was a paved path leading all the way up up to the temple from the village of Chopta which is the trail-head. We stayed at a small hut on the way up called Dev Darshani (so called because this is where the temple above becomes visible for the first time). On the first day we went up to the temple as well as the peak (called Chandrashila Peak) about a kilometer above the temple (and just above 4000m elevation), before coming back down to Dev Darshani for the night. … and a little clearer the next morning, but not by much. The snow-covered Chaukhamba peak is just about visible a little above and to the left of the cairn closest to the camera. The next day just happened to be the day that the Tungnath deity was being brought up to the temple (during winter months the deities at these high-elevation temples are brought down and kept at village temples lower down), so we got to see the procession taking the deity up! Click here or on the image below for a short video of the procession passing by. The video is grainy but the sound of the women singing is worth it! Soon after the procession passed us by at Dev Darshani, we headed back down to Chopta and onwards via Ukhimath to Uniana, where the hike to Madhmaheshwar begins. Since we reached Uniana by the evening, we hiked just 3km to a village called Ransi, where we spent the night. Ransi is a really beautiful village (even with smoke all around) with an old temple of its own. The plan for the next day was to hike past the villages of Gondhar and Bantoli and stay the night at Khatra, which is about 7-8km from Madhmaheshwar. However, at Gondhar village, we were told that we couldn’t go beyond Khatra because the temple was not yet open for the season, and so we needed permission from Ukhimath to get to the temple. There was way too much smoke in the air, and the views of the surrounding mountains (which is half the reason for going there if you’re not religious) were way too poor to make heading back to Ukhimath for permission worthwhile, so we decided to stay overnight at Gondhar (which is another lovely village) and head back the next day. A line drawing of Madhmaheshwar on the way. After seeing this, in a sense I felt like I’ve been to the temple! Gondhar village from my room’s balcony. The shed in the foreground is where we ate, and of course where we drank chai. We drank a lot of chai on this trip! So all in all this trip was a bit of a disappointment, since I didn’t reach Madhmaheshwar and none of the supposed exhilarating views were visible throughout the trip. However, I did find out that I can just pick up my bags and head out to the mountains (by bus) at the drop of a hat, and I suspect I’ll be able to hire a guide wherever I go. And the lack of views and aborted Madhmaheshwar leg will give me a reason to go back to these two sites during the appropriate season! This entry was posted in Uttarakhand and tagged chandrashila peak, dhabas, garhwal, hiking, himalayas, india history, madhmaheshwar temple, temples, tungnath temple. Bookmark the permalink. Varun! I’ve done the Tungnath hike in my college days! Your photos brought back memories! We stayed in Chopta for couple of days as well – just lazing around at a dhaba playing cards… ate the most tasty alu paranthas for breakfast everyday! Yum! Hope some day I’m working in Dilli so I too can head out to the mountains at the drop of a hat!Very nice… What a nice blog post to wake up to! Avigail – now that is the million dollar question, isn't it? :)And you're welcome here anytime! I am about to start a solo trip to a few places including Madhmaheshwar. Glad to have found your blog today! Try visiting Triyugi Narayan next time you visit Garhwal. It's off Gaurikund, and a rarely visited Vishnu temple is there to greet the tired and pious traveller. Ya I was thinking of going to Trijuginarayan but the smoke in the air just made any such detour not worthwhile enough. Maybe next time!